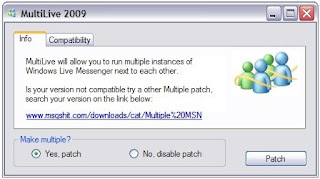 MultiLive is a tool to enable polygamy in Windows Live Messenger 2009. Polygamy allows you to open several sessions of WLM at the same time. MultiLive is very simple and easy tu use. Simply click a button and you can run multiple instances of Windows Live Messenger. There is no more additional features and this tool's size is only 32kb and requires no installation, just run it and nothing else. MultiLive is tested on Windows Live Messenger 2009 Build: 14.0.8050.1202 and Build: 14.0.8064.0206.